Propaganda and David Lean’s This Happy Breed. 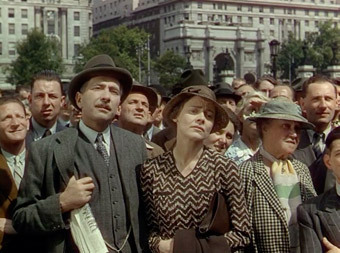 David Lean’s 1944 film This Happy Breed is the first real starting point for a large audience based drama around the lives of the working class. It is a contradictory tale of a working class family unit, moving with the times between the two world wars and tied to numerous limitations, both thematically and by regulations of what was deemed acceptable for public broadcast. The obvious ironies and contradictions can perhaps be attributed to the fact that the film was one of the most pure of propaganda films. It is hard to criticise the film in light of this as the potential misnomers and falsities it commits are present for justified reasons, yet both the film and its music are littered with elements that romanticise the hardship of the working class. “Coward’s failure to perceive social change is again apparent in his script for This Happy Breed (d. David Lean, 1944), which is set resolutely in the past.” states Gillet (2003, p.35) who is questioning where the romanticised propaganda is born from, narrative or aesthetics. It will become clear that it is born of both. The score is of a typically flowery nature but is a move away from the piano lead scores of Lean’s other films. It’s interesting also in comparison to his adaptation of Oliver Twist (1948) which shows a working class life far removed than that shown in any of the films mentioned in this essay. Whereas the score in that film is piano led, it again is romantic in the typical Caryl Flinn sense of the word (“Music continues to play a key role in triggering this widescale yearning for yesterday.” (Flinn, 1992, p.152)). Her desire to portray a classical score’s presence as being one based around nostalgia and utopian ideals is one backed up well by both the scores for This Happy Breed and Oliver Twist though can be related to the former as an ideal that wishes to be applied to its present era. It contains far less music than our other case studies but what is there is a handful of techniques, largely based around the classical film score tradition. “There are some fairly obvious reasons: it is likely to be cheaper, and it can be used to marshal particular connotations of culture and class” argues Cormack (2006, p.19) when discussing the general use of classical music in films. His former argument doesn’t especially apply to a financially secure director such as Lean but the latter most certainly fits the model of This Happy Breed. Credit for the score is shared between two people; Muir Mathieson and Clifton Parker. The former has a background in conducting and orchestrating for big British films such as Laurence Olivier’s Hamlet (1948) and Henry V (1944) while the latter worked more in adventure and horror films such as Night of the Demon (1957)[i]. Mathieson’s presence perhaps reveals some of the reasoning behind the scores majesty and almost juxtaposition against the logic of working class life. Lean and Coward found much drama behind the doors of the working class yet kept a lot of real issues such as domestic abuse, homosexuality and class injustices at bay. Dave (2006, p.6) asserts that this is because the film has a “pastoral vision” which “offers a simplification and harmonising of the complexity of class and social relations that is common to heritage and documentary realist film…”. 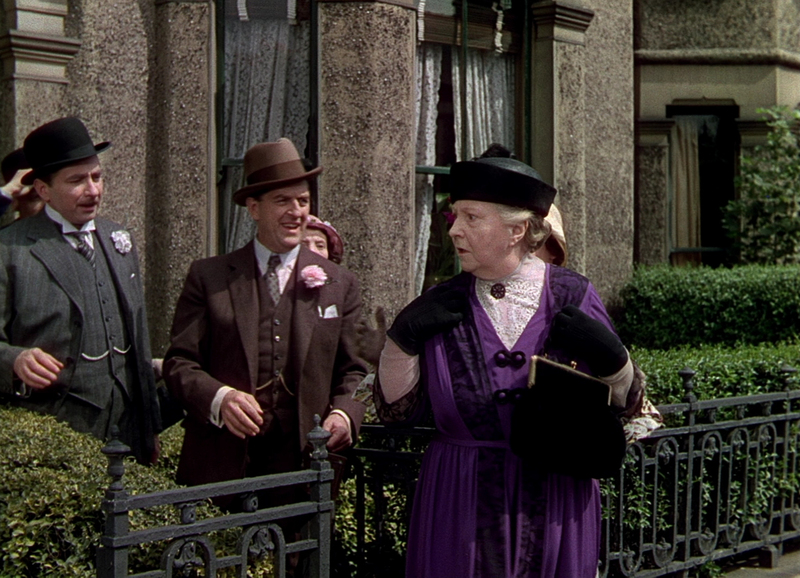 The score helps this along with flourishes of flutes and strings straight out of an Ealing comedy, making even the more daring aspects of the film (unions unrest, the British fascist party, relationships with married men etc) seem quaint and of a chocolate box nature. Silence and the Sound of Time. The use of silence is also a point of notice in the film. Despite the twee nature of the meagre score it has, nondiegetic music makes only a handful of appearances. This seems more down to the story’s origins as a stage play rather than a specific creative ideal, with many scenes being dialogue heavy. When music is used, it’s often to guide the viewer along with the emotional highs and lows of the characters; an emotional mirroring perfect for wartime propaganda. However, in the case of This Happy Breed the representation of the nation clearly fits Nairn’s disparaging remarks about the pre-modern forms of English nationalism – the film’s “conservative populism” is one in which “traditional forms of political and social power” are ultimately re-affirmed.” is the scathing analysis by Paul Dave (2006, p.10) which shows that its elements of propaganda does not convince everyone to forgive its thematic flaws. It is fitting then that its moments of despair are often in silence though Dave(2006, p.6) also describes the film as one of the “Wartime story- documentaries” so perhaps this theatrical method has had some positive effect on the more unforgiving viewers; there is no possible condescension when a film is silent. The movement of time is also addressed through music, though in the oddest of ways. Descending harp trills akin to the most clichéd of dream sequences move the narrative forward a year or two on more than one occasion. This seems to imply that the story is being recalled[ii]. Lean’s choice in music is just one of the many aspects of This Happy Breed that gives working class life a veneer of propaganda. Any mention of the injustices in the class system are treated in the same way by the characters as the filmmaker; ironic and jovial. One character in particular is a unionist, and his views are mocked by both Queeny and the camera itself, which later shows him to have realised his error in sharing such a view and has him married into a respectable life with two children and a job. “As a consequence, war is presented as a middle-class affair, in which the working class play a supporting role.” sums up Gillet (2003, p.35) which explains a lot of why the inner debates around the British class system were unwelcome in propaganda film. The fact that “In the early years cinema appealed primarily to working-class audiences, particularly to adult women and youths of both sexes.” means that the ideas intended for masses were not one of questioning but of blind support for middle class endeavours (August, 2007, p.212). This is one of the paradoxes of Lean’s choice of music. It is a non-argument that other music could be used as the film is made in years before pop, electronic or other forms of music were readily available. Even the film’s title is designed to convey a cosy patriotism “and has traditionally served as a shorthand expression of national pride.” (Hill, 1999, p.138). Of course a film about the working class was bound to be scored in this way in 1944, even if its narrative shares as much of an addiction to romanticism as its limited musical score. Kalinak (1992, p.33) argues that “Film music binds the spectator into the fictive reality through its promulgation of identificatory affect between audience and screen.” and so it can do nothing else besides be a comfortable bed fellow rather than be a questioning presence if it is to remain a piece of positive propaganda. However not everything from its musical landscape is as typical. Various hints at what is to come in the sound-worlds of working class representation in film are embedded. One scene in particular stands out, even sharing a number of resemblances to Distant Voices, Still Lives’ opening scene. When the parents of the household find out their son has tragically died in a car accident, the viewer is unaware of their initial reaction. Being both out in the garden, their daughter goes out to tell them, leaving the camera in the empty room. Moving around the empty space, a radio plays some light dance hall jazz implying all sorts of metaphorical meanings. It could be construed that a stiff upper lip mentality is represented, with the parents entering the room with the happy music still playing loudly within the sound mix, in spite of the tragedy. It does however give a harsh juxtaposition to the narrative and so is perhaps addressing the only major issue it can really talk about: war. Diegetic Sound in This Happy Breed. Other music makes its presence felt too besides its nondiegetic score. Diegetic music is one of the most popular choices in all of the films presented in this essay; often being used for similar purposes as nondiegetic music but deliberately grounding it in a recognised reality. The film has strong military connections used by the narrative as a comment on the, soon to finish, Second World War. However military music does make its presence known in one particular scene of a visit to a parade of a marching band by the Cenotaph. The old war song “Over There” is played, giving it a wonderful period accuracy. Though it may be difficult to dissociate the melodies from its modern day use as the Go Compare car insurance jingle, the music highlights yet another, albeit obvious use that is used in both the 1960s realist films and Distant Voices, Still Lives; evoking the period in question. One piece of music that is used seems to have become a leitmotif lasting years in its use. When listening to the radio broadcast concerning King George’s death, the music played is from Beethoven’s 7th symphony (second movement). However, covering the same topic over sixty years later, The King’s Speech (2010) uses exactly the same music to represent its triumph. Whether this is a quiet nod to This Happy Breed or whether both films used it for period accuracy will only be a question answerable by the filmmakers. It does however seem more than a coincidence and ironic that the piece is used in films about the polar opposites of society, perhaps suggesting that even in Britain, music has the power to transcend class. “When used as a film score, then, rather than the music’s range of meaning narrowing, that range is likely to be increased” is Cormack’s (2006, p.21) argument for the contextualising of the film music and this relationship goes someway to proving it. This Happy Breed covers twenty years of family life, taking in many of the political happenings along the way. Though the segues between each era and year are often clumsily handled through an over obvious zoom into a calendar or depiction of a famous event, when initially grounding the year aurally, the film uses a number of various effects. How the characters listen to their diegetic music is one aspect that stands out. Music enters the lives of characters with more and more ease as the years pass by. It is first brought to the family at Christmas by one of their own singing and playing the piano. Music gradually becomes easier for the characters to obtain with various radios of increasing quality playing faster and more dance orientated jazz; moving away from the traditional music presented and the nondiegetic score used. This marks a pleasingly subtle parallel with the different generations of the family and their political standpoints. However the film rigidly sticks to its role as a propaganda film and generalises the lives of the younger generation; a generation that would take precedent in the films of the British New Wave. [i] This may also explain how Olivier came to provide the occasional narration in This Happy Breed. [ii] As does the presence of a narrator. The Complete (Existing) Films of Sadao Yamanaka – Masters of Cinema.